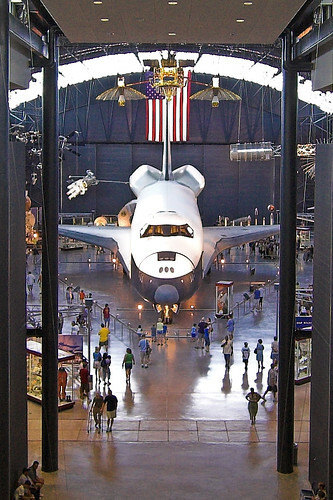 Built in 1976, the Enterprise was the first space shuttle orbiter but never flew in space. It was used for series of atmospheric test flights including free-flights and landings to test systems and aerodynamic performance. I have quite a few more pictures from the Air and Space Museum that I have yet to upload, and those will come. However, our time in DC is drawing to a close and we'll be getting back on the road soon. Yesterday, to combat the 100 degree F weather, we made a 3-hour excursion to sandy beaches of Ocean City, MD and had a swim in the Atlantic Ocean! I hope it is not too hot for you ..
Nice pic of the Enterprise! It must be fascinating to see something like that in person.